Through some complicated circumstances, one afternoon I found myself with a borrowed car & a couple hours to kill in the city, which obviously I wanted to fill with sketching. It was a super foggy, cold, rainy day, so the car became my mobile studio since drawing outside was out of the question. I've been up to Kerry Park a couple times to take in/sketch the stunning skyline, Sound & Ranier views, but I also wanted to capture the crowds who gather here for photo ops sometime. I knew I could get a decent view of the overlook from the street parking, so it was the perfect opportunity to sketch the scene I had in my head. 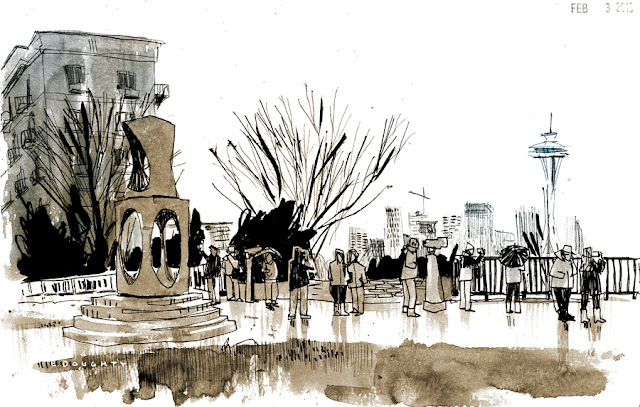 In my urban sketches, I aim to get a wider view than what you'd expect, incorporating the context of the scene. 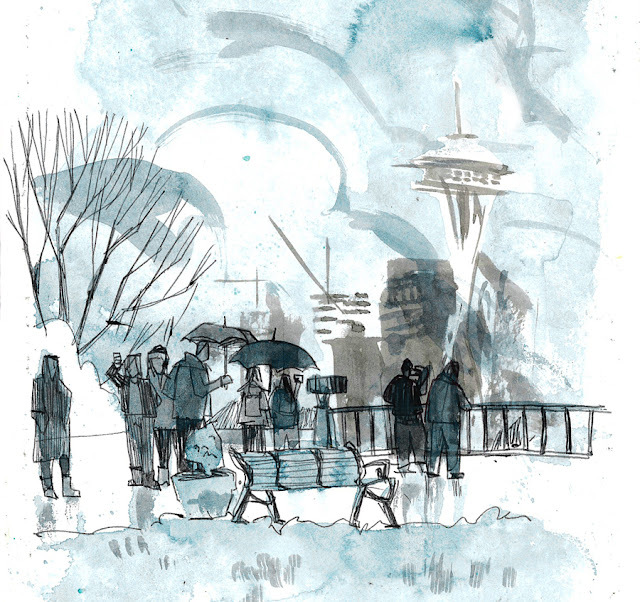 In this case, the scenery – usually the main attraction at Kerry Park – becomes a backdrop for the main subject, the people. Next time I want to do an even wider view, getting the sidewalk and condo buildings in too! First attempt - I like the distorted distant buildings, but the view wasn't as wide as I wanted. The clouds were so low you barely see the Space Needle at times. Bonus: At the western end of the same street of Kerry Park just a few blocks away, there's another super stunning overlook that is almost always nearly empty, if you want a great view sans crowds of sightseers. The below sketch was done on the last day of 2017, one of those magical amazingly clear days which compel EVERY Seattleite to go outside. Watching the sun set over the Olympic mountains was a great way to end the year, even if my hands froze while drawing this. Excellent capture of the kind of day all tourists dread -- but it obviously didn't keep them away! I love your use of black at the base of the trees in the first sketch... it works so well. I'm always nervous about diving in this dark, but I can sense your confidence here. bravo!